Yes. PureGraft® is FDA approved. Puregraft’s selective filtration technology was designed to dialyze fat tissue in a gentle and reproducible manner to preserve the regenerative properties of fat. When using the Puregraft® System, you can expect the same, high quality fat tissue in every syringe for every patient. Adipose tissue is injected into the Puregraft® System and filtered through the first membrane to remove blood cells, free lipid, tumescent solution, and other impurities introduced from the liposuction process. The second membrane directs the flow of debris for draining into the waste bag. The fat tissue is then washed twice with a defined volume of Lactated Ringer’s or saline solution. The purified tissue is then extracted from Puregraft® and prepared for re-injection into the body. What are the procedure benefits? 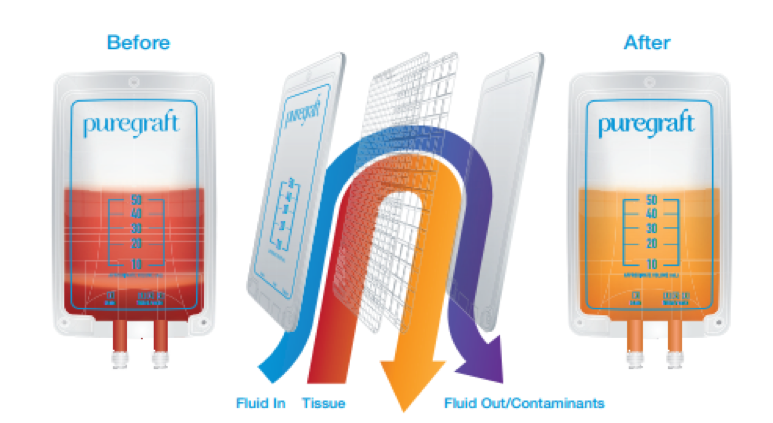 User-controlled graft hydration minimizes the need for overfilling. Significantly reduced free lipid and blood cell content minimizes inflammation. Reduced inflammatory cell content minimizes immune response and reduces recovery time. Atraumatic handling minimizes tissue damage and increases graft viability. What are the features and benefits of using PureGraft®? Multiple sizes accommodate 50 – 850 mL of adipose tissue. Efficient processing in under 15 minutes. Selective filtration retains important growth factors and removes > 97% lipid, RBCs, and WBCs. Closed-system processing decreases risk of contamination. Consistently high graft quality across different harvest techniques. Where can I find more information about PureGraft®?